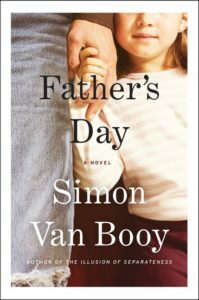 I stumbled upon Father’s Day by Simon Van Booy on the remainder shelf at the bookstore. It caught my eye, I made note of it, and ended up picking it up at the library last week. It was (probably) my last book of 2017, and it ended my reading year on a very high note. Father’s Day is about a girl named Harvey (yes, weird name choice) whose parents died when she was a little girl. With no other family around, she ends up living with her uncle Jason, a violent ex-con who served time for beating up another man and blinding him. At first, Jason is reluctant to take Harvey, but a persistent social worker wears him down until he can’t bear the thought of her going into foster care. Harvey and Jason form a little family, with him learning how to be a father and her helping him learn how to love. It sounds corny, but Van Booy shies away from sentimentality here. Jason is a damaged man, and Harvey has her own bursts of anger and frustration. They don’t have a lot of money, but they get by. Jason sells his beloved homemade motorcycle to pay for Harvey’s orthodontia, but it isn’t until Harvey is grown up that she truly understands his sacrifice. The book goes back and forth between flashes from Harvey’s childhood (and even earlier) and the present, where Harvey is now living in Paris and Jason has come out to visit for Father’s Day. There is one plot gimmick that I didn’t love – Harvey presents him with little gifts throughout his visit that have meaning to the two of them and trigger more flashbacks and explanation. I don’t think Van Booy needed those presents to tell his story and the whole construct ends up feeling contrived. Because Jason is so flawed, but such a decent man, the story is realistic and very compelling on its own without those triggers. I really, really enjoyed Father’s Day. It’s a gentle but not saccharine, suspenseful but not stressful, and very well-written. Excellent way to end the year of reading.